Celebrate the holidays with us and receive free food, household products, medical supplies, personal care items, baby supplies, kitchenware, and more likewise, along with other helpful resources to make your life better. We host Fourth of July and Christmas big events, along with some smaller programs between the two. Support our organization to ensure our biannual events continue for years to come. Your donations make a big impact in the lives of families throughout Mecklenburg and Neighboring Counties. Join our power team and help make our greater communities a better place to live. We are always offering volunteer opportunities to help make our events more fun and organized for everyone who attends. In order to participate you must register by calling our office. Feel free to download any forms that you may need for additional information and documentation for your consideration. If you have any questions about the event or registration, please do not hesitate to give us a call. community outreach program in Charlotte, NC. Click here to learn more about our community outreaches. The Big Super Ten Event is a community outreach program in Charlotte, North Carolina. 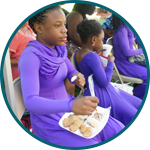 We organize and host free community outreach events that benefit more than 500-700 people annually from a diverse pool of people and families. Our organization does not just provide goods and resources; we also create fun and encouraging activities, and educational information along with volunteer and networking opportunities to enrich the lives of people in need, to fill in gaps in our greater communities, and to make our area a nice place to live. By working with the community partners at large and utilizing various forms of media and public speaking event, we promote the healthy development of Mecklenburg County and neighboring counties. Each year we strive to do better than the last and come closer to ultimately achieving our mission. Our mission and purpose is to improve and develop the impact of families and businesses by promoting health, education, physical fitness, networking, volunteering opportunities, encouraging activities, and by acting as a community outreach resource by providing goods and resources. This corporation is organized and operated exclusively for charitable and/or educational purposes within the means of section 501(c)3 of the Internal Revenue Code of 1986.